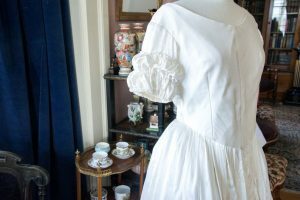 We recently put three wedding dresses on display in the house. View additional photos of these dresses. 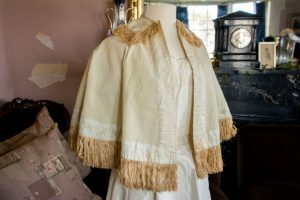 Made by Sarah Murphy for Natalie Beckwith Livingston in 2014 for her marriage to Brett Livingston, at the early 19th century Historic Sturbridge Village in Massachusetts on October 11, 2014. A dress like this would have been made perhaps for a wedding initially, then it would have become the best dress of the owner for various parties and then passed down to a sister or a daughter. 3 Piece Dress made of Silk/Lace bodice, skirt and wool shall with silk fringe Worn by Sarah (Sallie) Wisner Avery in her wedding to Christopher Avery in Jan 1850. 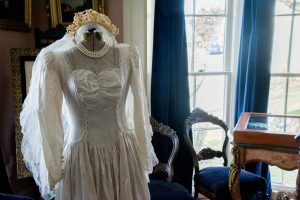 Also worn by her daughter Betsey Wood Avery Copp in her wedding to Belton Allyn Copp II In 1892. Dress made from parachute silk. Worn by a Connecticut woman after World War II. At a time when fabric was hard to come by, creative New England ingenuity saved the day. An actual used parachute-made in Cheney Mills in Manchester Connecticut, was repurposed to create this lovely Wedding gown.